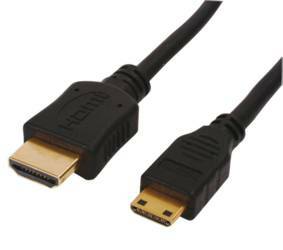 2m Long HDMI TO MINI HDMI CABLE High Speed With Ethernet - Mini HDMI Cable - Micro HDMI Cables, Short HDMI Cables, Hdmi Cables Same Day Dispatch On Our Leads If You Order Before 2pm Weekdays. HDMI to Mini HDMI cable. Suitable for HD cameras and camcorders that use mini HDMI cable such as Canon 550D. Currently viewing: 2m Long HDMI TO MINI HDMI CABLE High Speed With Ethernet - Mini HDMI Cable - Micro HDMI Cables, Short HDMI Cables, Hdmi Cables Same Day Dispatch On Our Leads If You Order Before 2pm Weekdays.